I’m starting with this as Saint Valentines day was only a few weeks ago and a visit to the church housing these relics prompted me to write this series of posts. So, Saint Valentine…what’s not to love? -he’s the Patron Saint of fiancees, bee keepers, happy marriages, love, plague, epilepsy and against fainting. To my surprise, not that much is known about the Saint and it seems that there may have been more than one St Valentine, leading to confusion over who the celebrated Saint actually was. History tells us that he died on February 14 on Via Flaminia in the north of Rome. One legend describes him as a miracle worker, who restores the sight of a blind girl. From his prison cell, he sends her a letter containing flowers, and when her sight is restored, the colourful flowers are the first thing she sees, but Valentine is executed by the Emperor Claudius as he will not renounce his faith. Another legend describes him as secretly marrying Christian couples. Claudius had banned all marriages so he could send men to war with no wives and children to distract them and keep them from his army. In this story, Claudius condemns Saint Valentine to be beaten to death with clubs and to have his head cut off. 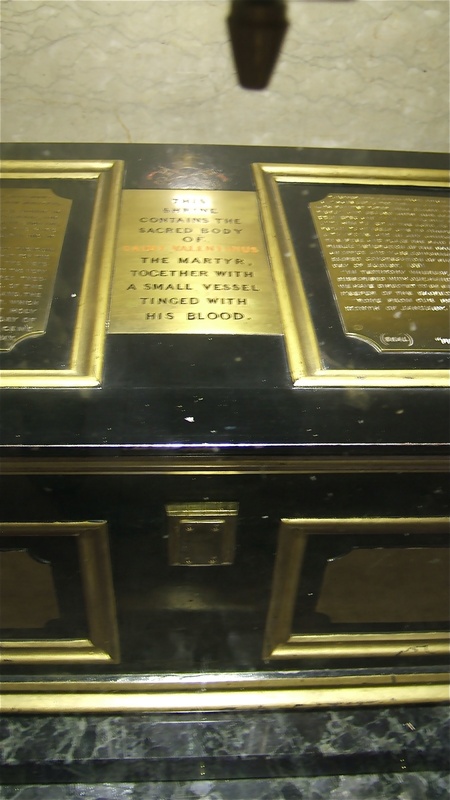 So how did his relics end up in the Whitefriar Street Church in Dublin’s city centre? Well, in 1835, Fr John Spratt from this Dublin church visited Rome and delivered some impressive sermons that drew the crowds. He received praise from many, including Pope Gregory XVI, who sent the remains of St Valentine to Dublin as a gift from Rome. When Spratt died, the relics went into storage and were only dusted off and put on display again in the 1950’s. According to the church’s website, Inside this outer casket there is a small wooden box which is covered in painted paper and is tied with a red silk ribbon and sealed with wax seals (which is the usual way in which relics are contained). The outer casket has only been opened on a couple of occasions and then only to verify that the contents are intact. The inner box has not been opened or the seals broken. It’s really surprising the number of Dubliners who not only haven’t visited the shrine, but aren’t even aware of its existence. The church itself is worth a visit as it has a number if interesting shrines and beautiful features. 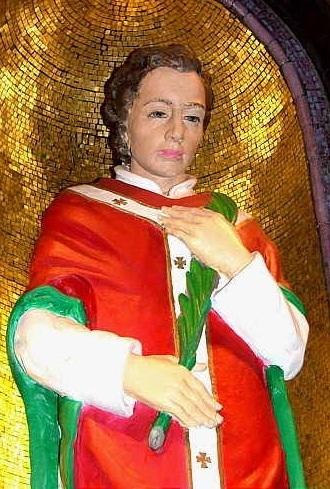 As with other relics, Saint Valentine seems to have his remains scattered around so many different countries, leading to obvious questions of authenticity. The Dublin shrine makes no false claims of grandeur as it states that it houses “some” of the Saint’s remains and for what it’s worth, it is accompanied by a letter of authenticity from Rome. 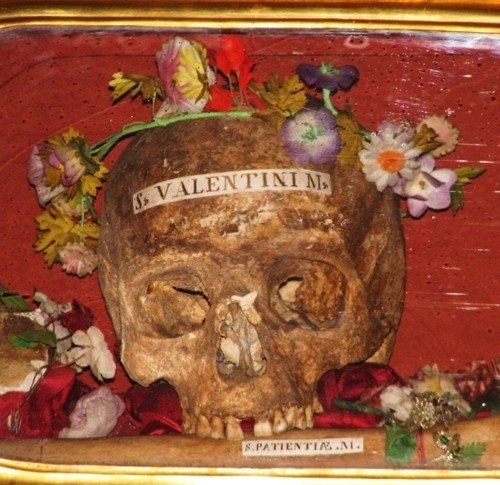 However, there is a beautiful flower-crowned skull of St. Valentine exhibited in the Basilica of Santa Maria in Rome and his shoulder blade was found recently (in 2003) in Prague. 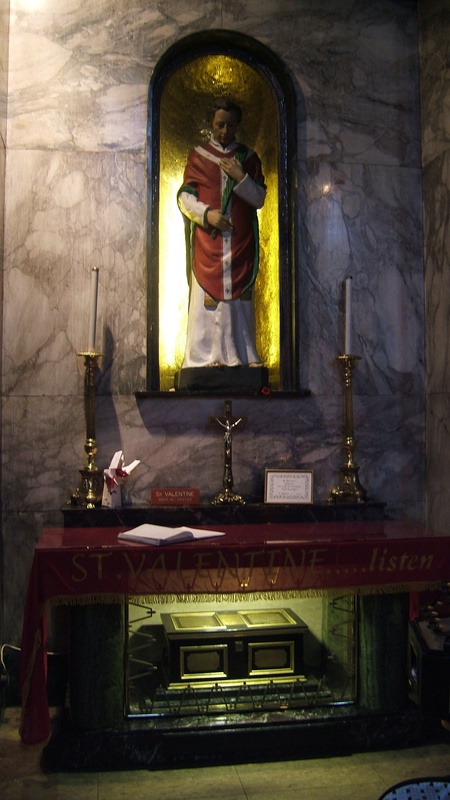 Other locations that claim to have relics of St. Valentine include Roquemaure in France, Stephansdom in Vienna, Balzan in Malta, Chelmno in Poland, Glasgow in Scotland and there is a gold reliquary stating ‘Corpus St. Valentin, M’ (Body of St. Valentine, Martyr) at The Birmingham Oratory, UK. 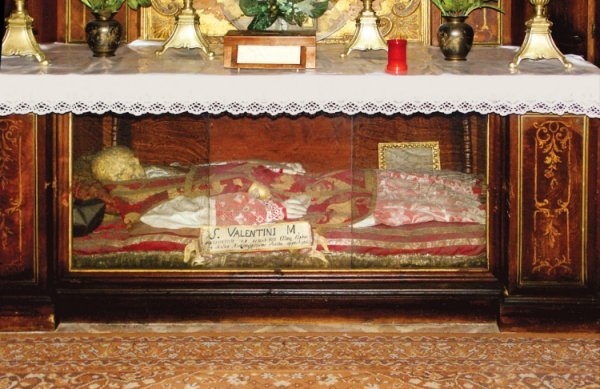 In Sicily, in the town of Monselice, there lies a church containing dozens of seemingly shrunken skeletons on display (they have had the longer leg bones removed to save on space), and with pride of place in the middle is the skeleton of St Valentine, clad in red velvet. And we are not just limited to Europe… St Valentine even travelled further afield with relics allegedly in Missouri. But back to the Emerald Isle… If you are in Dublin, pop in and see our lot. They are the real deal, we promise. Honestly. Well, maybe.